Joe Guard grew up on the waters of Buzzards Bay and is a life- long resident of Southeastern Massachusetts. He has a strong passion for the ocean and all things pertaining to boating and sailing. He graduated from North Carolina State University in 1994 and has owned his own multi-faceted, service-oriented business ever since. Joe has been a U.S. Coast Guard Master Captain since 2000. He loves nothing more than sharing his wealth of knowledge regarding all aspects of boats, from engine repair to boat handling, with fellow veterans or those new to boating. 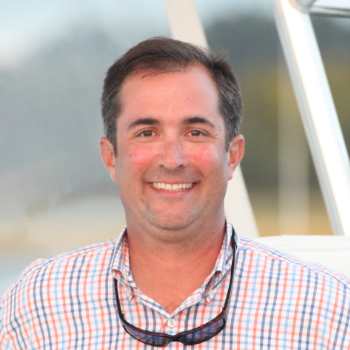 Joe prides himself on helping his seasoned customers find the boat of their dreams or helping new clients decide just what the boat of their dreams will be if they are planning to head out on the water for the first time. Joe is an active member of the Beverly Yacht Club, the Hyannis Anglers’ Club and co-founder of the Buzzards Bay Anglers Club. He is an avid boater, sailor & angler. He resides in Marion, MA with his wife and three children who share his passion for the ocean and his love of boats.